The second Phoebe and Her Unicorn graphic novel! Summer is here, and Phoebe and Marigold are headed to drama camp. Phoebe’s expecting some quality time with her best friend, but in a surprise twist, Marigold has invited her sister, Florence Unfortunate Nostrils! While the unicorn sisters head to camp in a magical rainbow pod, Phoebe is stuck riding with her parents in their boring car, wondering where it all went wrong. But at Camp Thespis, there are more daunting tasks at hand: writing, producing, and acting in an entirely original play! The second Phoebe and Her Unicorn graphic novel is a sparkling tale of sisterhood and summer fun, as well as a reminder that sometimes it takes a bit of drama to recognize true friendship. Dana Claire Simpson grew up in Gig Harbor, Washington, drawing the entire time. She eventually graduated from The Evergreen State College, despite having spent all her time drawing, and not always for credit. From 1998 to 2008, she drew the internet comic strip Ozy and Millie. 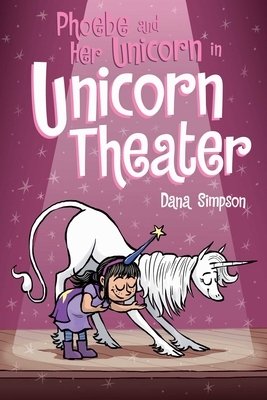 After winning the Amazon-sponsored Comic Strip Superstar Contest in 2009, Andrews McMeel Syndication signed her to a development deal for Heavenly Nostrils, which was later renamed Phoebe and Her Unicorn. She currently lives in Santa Barbara, California, with her tech genius husband and her fairly stupid cat.